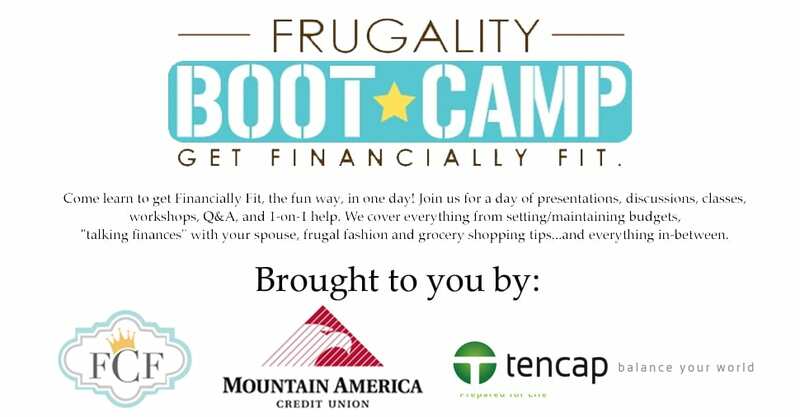 Guys…Frugality Boot Camp is literally a few weeks away! Is anyone else so excited? For those of you who live out of state and can't travel in, just hold on, I might just have some exciting news for you coming up on Saturday *wink wink hint hint*. In the meantime, I wanted to introduce you to the team that is not only making FBC'14 possible, but is making it better than ever this year! It's because of these sponsors that allows us to offer FBC at such a low price. Trust me, there is a lot of overhead that goes into throwing one of these conferences. We have hand-picked every sponsor (and yes, we are very picky) based on the quality of what they provide, and how it can benefit YOU. So please take the time to read about them and get to know them better…you'll be happy you did! P.S…FBC is only 28 days away and tickets are going fast. If you don't buy now, it might be sold out…so hustle your buns! Mountain America Credit Union is a full-service financial institution that provides a variety of personal and business services, including Auto Loans, Mortgages, Business Services, Credit Cards, Retirement Planning and more. With branches in five states and a nationwide network of surcharge-free ATMs, they are always accessible. For more information, visit macu.com. New to FBC this year, we are excited to introduce Greg Black! Greg is a financial coach that sparks changes in the way people view personal financial management. His unique approach gives clients a confident alternative to plan for their future. Greg is the owner of Tencap, an independent advisory firm that was built to provide education and coaching to investors. Greg coaches his clients in three important areas. 1. Risk Management- eliminate threats that could harm your financial future. 2. Efficient Savings- store money in places that are low risk, accessible, and create consistent returns. 3. Confident Investing- form strategies that don’t rely on speculation but rather provide measurable standards for risk and return. Greg is a strong voice for financial critical thinking. He has shared his message in documentaries, books, articles, audio programs and workshops. His enthusiasm to illustrate financial principles is evident whenever he speaks. Also new to FBC this year, Life1010 is definitely a company to get to know. Many people know it is important to plan for emergencies, budgeting, retirement and living a balanced life, but these topics can be incredibly overwhelming. With so many questions, so many different answers, Ed & De Kinsey and Marc & Kelli Roethel decided they would set out to find a simple solution to these complex questions and LIFE 1010 was born! Life1010 is the 52-week “prepared for life” program they created to help average people like us organize finances, prepare for unexpected emergencies, and make educated decisions about retirement and investment options. And that is exactly what the Life1010 program has been designed to do. Life1010 has become one of the fastest-growing online life and financial coaching programs available. Each week, participants receive an email lesson and assignment that builds from one lesson to the next over the course of the year. For example, some lessons include “PrePare: The Survival Kit For LIFE” with home assignments that include preparing for emergencies, “SpendWize: The Spending Plan For LIFE” with instruction on how to build a personal and family financial plan, “LifeZen: Because Wealth Without Health Isn’t Wealth At All” which addresses balancing health and wellness, and “ReTire: The Retirement Plan You Can Count On” which talks about how to anchor retirement with safety nets and sound investments. Comprehensive in its design, Life1010 is a program designed to be simple, while couples and families develop a complete and organized plan for health, social and financial wellness. ”What is the best way to eat an elephant? One bite at a time!” LIFE 1010 helps you tackle these big life questions one little step at a time. You might remember Kirk Voss from FBC last year! He is a Licensed Marriage and Family Therapist who works with individuals, couples, and families to address a variety of emotional and mental health issues. He is going to teach us how to communicate effectively with our spouse…namely about, you named it, finances. Kirk received his Master’s degree in Family Studies: Marriage and Family Therapy from the University of Maryland. He received his Bachelor’s degree in Human Development and Family Studies from the University of Utah. Kirk is a member of the American Association of Marriage and Family Therapy, and he is fluent in English and Portuguese. He has worked as a therapist in both inpatient treatment and outpatient community therapy clinics in both Maryland and Utah. He also worked for several years at LDS Family Services, and he is now a Referred Provider for that agency. Kirk works with clients from all backgrounds and religions, typically teenagers and adults. He believes that what often brings clients to therapy is their loss of balance—either a desire to attain a personal balance and positive well-being, or to restore balance which has been lost. Finding a healthy personal balance can involve improving self-care; improving self-worth; clearing the “clutter” of negative thinking; addressing past and present emotional injuries; deepening and healing close relationships; and addressing stress, anxiety, and depression. Kirk focuses especially on the quality and healing of relationships in both marriage and families and will be helping us all learn to discuss finances successfully with our spouse. We hope you fall in love with this team as much as we did!